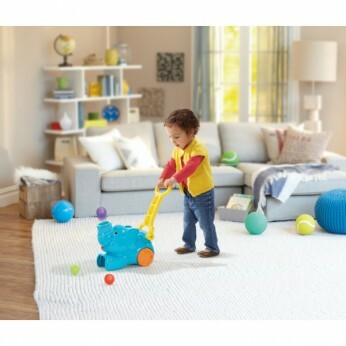 Watch your little one race round collecting the colourful balls as this Playskool blue lively ball poppin’ elephant provides hours of endless fun. The air-powered Elefun will delight your little one as coloured balls pop out of the cute trunk, whilst having to quickly scoop the balls up in the elephants feet, an exciting game that also improves coordination. Balls pop out of the Pop ‘n’ Pick Up Elefun’s trunk. Roll over the balls to start again; Put and take ball play; Easy-grip handle; Store the balls in the handle. Includes 5 colourful balls. General information: Size H35.6, W35.6, D15.2cm; Weight 1.87g; For ages 18 months and over. EAN: 5010994732653 WARNING(S): Only for domestic use; To be used under the direct supervision of an adult. This toy costs approximately £17.49 (for the latest and best prices make sure you check our retailer list for the Playskool Pop N Pick Up Elefun above). In our review of Playskool Pop N Pick Up Elefun we classed it as being suitable for ages 1 to 3 years, 3 years, 4 years but recommend you check the manufacturer specific advice before purchasing.